Which he loved like a wife and called Nell. Had made her as cranky as hell. And put up with her crotchety ways. And was close to the end of the line. At the bottom of Congleton Bank. In the Lion & Railway Hotel. Who was known in the trade as Big Jake. And from Land's End to Southend-On-Sea. And they drove up the A1 for tea. There was nothing but rust and decay. She was quietly rotting away. Bought old Nell and restored her to glory! And a new diff and gearbox as well. In her fresh coat of paint she looked new. He still loved her, to give him his due. Made from tin cans, as likely as not. As old Nellie ran over his foot. Leads to aggro - you're best buying British! This epic love story was written in the 1990s when I was working for ERF Ltd and the company was making a big thing of being 'the last British truck maker' and plastering union flags all over everything in sight. 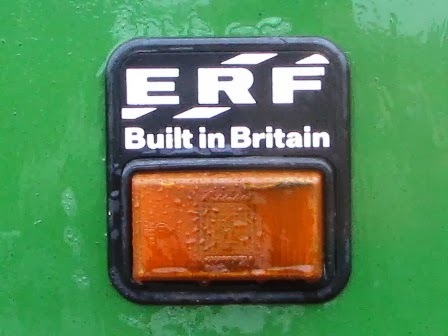 Even those slanting 'sun rays' in the ERF trademark (put there because of E.R. Foden's belief in the health giving properties of sunlight - hence 'Sun Works') were made to look like bits of a union jack. This little bit of doggerel was my attempt to capture the mood of the times. I've had a lot of fun with this little bit of nonsense over the years. Audiences love it, because the story of Nell has obvious 'highs' and 'lows' and, if they're in the right mood, those audiences will respond with cries of 'Awwwwww...' (for the sad bits) and 'Hooray!' (when you get to the happy bits). It's obvious, of course, what kind of truck Tanya is. I'm not saying that in a censorious way. I'm not trying to imply that she's 'no better than she should be' (even though she isn't, of course). She was obviously built by that Johnny Foreigner company whose name rhymes with hers. It's just that when the audience knows what's coming (or thinks it does) and you substitute something else at the last moment, confounding their expectations, you should get a laugh. All true-born Cheshire folk will not need to be told that the word 'bank' in verse four - as in 'Congleton Bank' - is pronounced 'bonk'. And you'll notice that our favourite pub, the Lion & Railway gets a mention as the place where Geoff goes to drown his sorrrows. As I've said before, the nearest pub to us with that name was in Northwich and closed down many years ago. All the characters in these poems frequent the Lion & Railway because the name fits so well into comic verse like this. 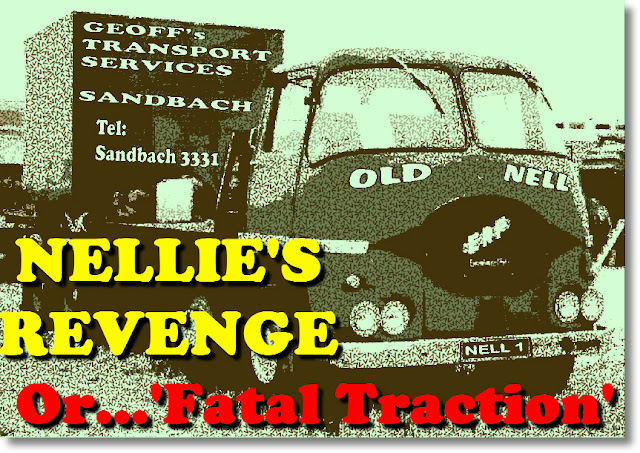 I hope everyone will take 'Nellie's Revenge' in the spirit in which it is intended.